Oh look it’s a fake memory stick that plays pranks on your victim’s computer! 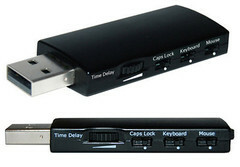 Simply plug this USB device into someone else’s computer and it’ll turns caps-lock on and off, make random mouse movements, type out random text and generally be The Most Annoying Thing In The World. It’s got a cunning time delay feature so that after installing it, you can make your getaway safely before it starts misbehaving. This would tip a person into lunacy after five minutes of attempting to word process anything. Makers Thumbs Up Uk claim that though the Prankster is highly annoying, it’s not dangerous because it’ll never activate the Enter key or close or save documents. They underestimate the ballistic fury of a frustrated PC-user; I’m envisaging coffee everywhere and some broken hardware.